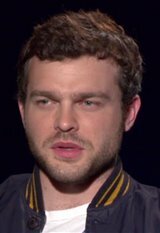 Born in Los Angeles, Alden Ehrenreich showed interest in acting from a young age, when he imitated Sebastian the Crab from the animated movie The Little Mermaid . Growing up in Pacific Palisades, he studied acting at Crossroads School Theater and obtained his gift of imagination and powerful storytelling from his interior designer mother. At a young age, he began making short films, a talent that aided in his discovery. One of his shorts, a comedy that featured him at age 14 breaking into a friend's house, trying on her clothes and eating dirt, was screened at a friend's bat mitzvah. One of the guests was Steven Spielberg, and he was so impressed by Alden's acting that he set up a meeting for the teen at DreamWorks. Following the meeting with the studio's casting department, Alden had an agent and began going out on auditions. His first professional acting appearance was at the age of 15 on the TV series Supernatural, followed by a guest shot on CSI: Crime Scene Investigation. By the age of 19, he'd appeared in Francis Ford Coppola’s drama Tetro , playing Bennie, a young man who travels to Argentina to find his estranged brother. The film was released in 2009, and Alden received favorable mentions, being compared to the likes of Jack Nicholson, Leonardo DiCaprio and Matt Damon. He next appeared in Coppola's 2011 thriller Twixt (2011), starring opposite Val Kilmer and Elle Fanning. During that time he also studied acting at New York University. Alden's breakout role came when he was cast as the romantic lead in the Warner Bros. release Beautiful Creatures , based on the best-selling fantasy novels for teens. Since then, he's completed a role in Woody Allen's Blue Jasmine (2013) and the horror-mystery Stoker , which debuted at the Sundance Film Festival and stars Nicole Kidman and Mia Wasikowska. He also starred in Hail, Caesar! (2016), playing a movie star cowboy in Hollywood's Golden Era, and Rules Don't Apply (2016), playing a limo driver for Howard Hughes (Warren Beatty) who falls in love with one of Hughes' muses (Lily Collins). However, his biggest break to date may be when he was cast as a young Han Solo in Solo: A Star Wars Story (2018). The film was directed by Ron Howard.